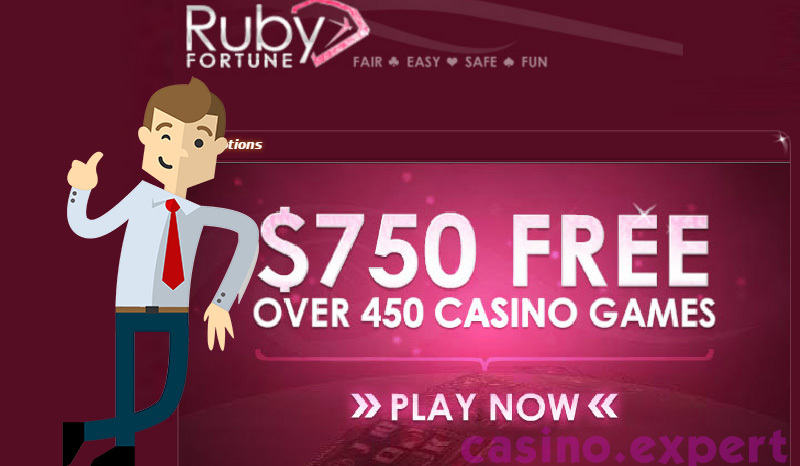 Ruby Fortune is a beautiful online casino that was established more than a decade ago, and has really made quite a name for itself over the past twelve years. If you are looking for an online casino that stands out just a little bit more from the rest, then Ruby Fortune is definitely one that you should give a shot. The theme of Ruby Fortune is slightly different than some others out there, but definitely not in a bad way. It’s a much more subtle approach to online casinos, and the color scheme really fits the name of the casino nicely. The games on the home page are not catalogued in a typical 2d thumbnail image, but have more of a three dimensional appearance by using a layered image. The site is very easy to maneuver through, and you will no doubt have no trouble find any game that you are looking for. Overall, this online casino is easy to maneuver through, which really makes logging on and playing casino games extremely easy. Ruby Fortune casino made its debut in the world of online casino gambling in 2003, and has since then become one of the six casinos that are part of the Palace Group brand. Their catalogue of games currently contains more than four hundred fifty of your favorites, as well as plenty of new games that you may be wanting to try. They are keen on updating their game catalogue on a regular basis, and add new games constantly to make sure that players always have a great selection. Ruby Fortune Casino is proud to have online gambling certifications in Malta, allowing people in multiple areas around the globe to participate in online gambling on this site. For more information on what particular regulations are affected by this, or to view the policies and procedures that have been put into place for this website, simply click on the Terms & Conditions link at the bottom of the page, and you can view all the legalese at your leisure. Before you sign up, take a visit to this page and make sure that the country in which you reside is not on the list of excluded countries. A large selection of online casino games is crucial for any online gambling site to be successful, and Ruby Fortune has one of the best selections out there. There are nearly 500 games to choose from currently, which means that you could go in and play a different game every day for almost a year and a half and never have to play the same one twice. While that may seem like a lot, it’s really a great amount. There aren’t so many games that you feel overwhelmed with the selection, and aren’t too few so that you get bored with the ones available too quickly. They also update the site with the hottest new games available so that their players have access to them as soon as possible. The menu on the right hand side of the screen allows you to quickly navigate through the various game types that Ruby Fortune features. Live dealer games have not been available in online casinos for an extended period of time, and have never been as well done performed as now. While there are only a few different kinds available, the only one you’ll be able to take advantage of at Ruby Fortune is for Texas Hold ‘em poker. This is a great option that few other casinos have, and makes playing this poker game a lot more interesting and realistic. Live blackjack and roulette may also make their appearance at Ruby Fortune in the future, as long as the Texas Hold ‘em game proves to be as successful as is anticipated. Live baccarat is another live version game that has the potential to become part of this online casino’s repertoire. Ruby Fortune has a spectacular mobile version that is gaining more players every day. It’s currently available for iOS and Android phones and tablets, as well as Blackberry devices, among others. To play in the mobile casino, you’ll want to log in to your account. This gives you immediate access to your bankroll and allows you to gamble with real money anytime, anywhere, without having to feel tethered to your desktop or even your laptop. While the gaming experience does vary slightly from the desktop version, the graphics and sound effects are still great, and you don’t miss out on the casino experience at all. Mobile gambling is quickly becoming more of a standard, and nearly, if not more, popular than desktop gaming. As technology, software, and graphics continue to improve, so does the popularity of mobile gaming, and it/s expected to continue to increase. Ruby Fortune is constantly on the lookout for the newest and best online casino games available in an effort to give their players the best variety and selection of games possible. The number of new games that is constantly being released is huge, but the people at Ruby Fortune make sure that they weed out the ones that aren’t very good to only bring you the best options. Titans of the Sun Theia and Hyperion – Titans of the Sun is such a big game that they had to release it in two smaller parts, which have been dubbed Theia and Hyperion. The layout of these slots is pretty standard for five reel online slot games, but that doesn’t mean they’re any less exciting to play. Pick one game to play, or switch between the two for the ultimate online slot game experience. While they are similar, they each have their own unique features. Bridesmaids – Software giant Microgaming has always done a great job when it comes to developing new online slot games, especially ones that are based off of movies, and Bridesmaids is no exception. They went out of their way to make sure that got rights to scenes from the film, and incorporated them into the symbols on the reels, letting players relive some of their favorite moments from the movie with each new spin. Hot as Hades – Hot as Hades is another new game from Microgaming, featuring some of Greek mythology’s most popular characters. Hades, complete with flames for hair, takes the lead in this cartoonish slot, with special appearances from Medusa and her snakes, Poseidon, and Zeus. This slot features five reels, twenty fixed pay lines, and a whole host of different bonus and special features. The latter includes such things as free spins, and the chance to activate the multi-level bonus game, Quest for the Crystal Helm. This bonus game has five different levels, and gives players the chance to win two hundred sixty times their original wager. Scary Friends – Scary Friends online slot game is definitely a misnomer, as these must be some of the least scary monsters on the internet, and definitely fall more on the cuddle side. Instead of having the slot table be the only thing you view on the screen, you have a monster host on the left hand side, and the reels are right next to him. While there are only twenty-five pay lines, there are also free spins you can earn, and a bonus game in which you choose a symbol and win the prize that is underneath. This is game is definitely a nice change from many others out there, and a very fun and entertaining one to play. Ruby Fortune casino has one of the most generous Welcome bonuses available to new customers on their page, offering up to $/€/£750 for everyone that signs up. This is set up as a Match bonus, and is spread out over a player’s first three deposits, matching up to a certain amount on each deposit. This is much more than most other casinos offer to new players, and is definitely an incentive to play at this casino. It’s the only real promotion that the casino is currently offering, but that just means there is plenty of room for other promotions to be added to the online casino at a future date. In the case of their Welcome bonus, players don’t earn the full 750 from the get go, but have to instead make three different deposits, whose potential total equals that amount, and each one pays differently. With the first deposit, players can get a 100% match, with deposits up to 150. On their second deposit, it’s just a 50% match, up to 200, so players would have to deposit at least 400 to get the full 200 match. The third deposit is a 25% match, up to 400, so a 1200 deposit is required to get that amount. All of this must be done within a week, and you must adhere to any and all other regulations that are put into place regarding this bonus, which can be found by clicking on the Terms and Conditions link on the Promotions page. Royal Fortune isn’t part of any referral bonuses for new players, but encourages you to spread the word about Ruby Fortune to any players that may benefit from playing at this online casino. Rather than having their own individual VIP program, Ruby Fortune’s is done through their brand, The Palace Group. This brand’s VIP program is run through a series of casinos in their brand. This means that when you qualify for VIP status at Ruby Fortune, you are also one for every casino in their brand. There are not currently any cashback bonuses being offered through Ruby Fortune or their brand, but they may offer some in the future. Ruby Fortune does not currently offer any kind of No Deposit Bonus. The only thing that could be considered is their Progressive Jackpot Bonus, with is a 1k bonus issued to any player that is lucky enough to win a progressive jackpot of at least 25k. Just like any other casino, promotions can change often, and it’s likely that Ruby Fortune could offer some no deposit bonuses in the future. The Palace Group, the brand under which Ruby Fortune casino falls, is the one that runs and maintains the VIP program for this casino, as well as all others in their brand. This VIP program gives you access to multiple benefits, like VIP tournaments, special events, faster withdrawals, and a host of other special things. In order to qualify for VIP status through the Palace Group, you must have earned a minimum of 150k loyalty points or have total deposits of at least 10k credits. However, if you have VIP status at another casino outside of this group, you can submit proof of your VIP status there to The Palace Group for consideration into their prestigious program. There are currently very few promotions and events being offered at Ruby Casino. Aside from the deposit matching bonuses for new players, they also give a congratulatory bonus of 1000 to any player that hits a progressive jackpot of 25000 or more. 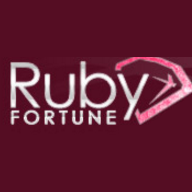 Ruby Fortune does not have nearly as many promotions going on as some other casinos, and it is very possible that they may offer some daily, weekly, or monthly specials in the future. Just continue to visit the promotions page from time to time to keep yourself updated on all that they have to offer. different languages, and can connect with representatives in your own language. The customer service that you will receive is excellent, and they can help you with anything from simple account questions to issues with payments at the click of a button. Once you have created an account on Ruby Fortune, the first thing you’ll need to do is make a deposit into your online account, especially if you’re looking to take advantage of their New Player Matching Bonus that they offer. They currently take most major credit cards, including Visa, MasterCard, as well as debit cards, eChecks, and other web wallets. They have sixteen different payment options available as well, which is more than most other casinos. You can use NeTeller, Skrill, or even Paypal to make your deposits, and can use the same methods for withdrawals as well. The sheer number of online payment methods that they accept is definitely a bonus when compared to some other casinos. While they have numerous options for deposits, they don’t have nearly as many for withdrawals, but that is mainly because the payment services don’t have the capability for withdrawals from an online account. If you are looking for the fastest access to the monies that you withdrew, if is in your best interest to research a couple of different options to see which one has the most expedient process. While many people try to use the same service for withdrawals and deposits, sometimes it is actually faster, or at least more convenient, to use two different ones, but it is all up to each player and what their needs are. What works best for one player may not work well at all for another, and Ruby Fortune understands this. That is why they have provided such a vast number of online banking options, to accommodate players from all around the globe, and to accept various forms of online payment. Ruby Fortune definitely has one of the most easily accessible customer service departments as far as online casinos go, and that is primarily due to their always available customer service representatives. Anyone that is familiar with playing in an online casino can tell you that problems or questions can come up at any hour of the day, and it’s always nice to have someone available to talk to and get a resolution. While most problems occur when the casino is at its busiest time, they can also frequently occur at the slowest times, and this is when many other customer service departments at other casinos are already closed for the day. If this happens to you at Ruby Casino, you can simply click the Live Chat button to connect to a representative, or if you prefer, you can use one of the telephone numbers provided to talk with a live person. Email is also available. Before you register to play at Ruby Fortune, or any online casino, you should only do so if it legal to gamble in an online environment in your home country. You should also check and make sure that your country is not listed under the Exceptions heading, meaning that you are not eligible to play in the Ruby Fortune online casino. Every casino has different eligibility, so it is a good idea to make sure that you read the rules and regulations thoroughly. Ruby Fortune has a really great layout, is easy to use and maneuver through, and has a wide selection of games. It has quite a few games and features, like Live Texas Hold ‘em, that few other online casinos offer, which is a great asset to this casino. The fact that they have so many different methods for deposits and withdrawals, and have customer service available at all hours every day is an added plus. 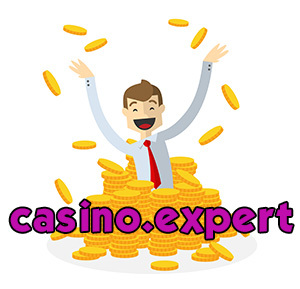 While it doesn’t have as many promotions and specials as other casinos, this gives them the chance to develop their own, and gives time to work out all the potential problems that they could have. Although it has been around for a while, as far as online casino time goes, it still has some cutting edge features and layouts that many other online casinos are lacking.